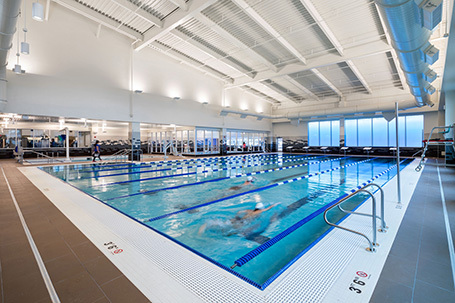 The Valley Center for Health and Wellness was designed to promote the next generation of healthcare delivery by focusing on improving the health for the community and keeping patients healthy and out of the hospital. The new 80,000 sq. 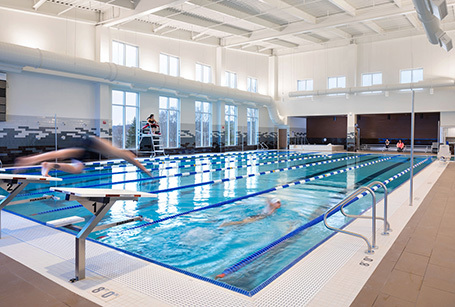 ft. center feature a variety of amenities including an aquatics area with a six lane lap pool, leisure pool and a warm water therapy pool; a running track; a fitness floor with a gymnasium; and an area with free weights and group exercise rooms. The remaining space includes a range of health and wellness services including health screenings, a diagnostics laboratory, physical therapy, cardiac rehabilitation, occupational therapy, The Valley Hospital Sports Institute, urgent care / physician offices, community health programs and services, retail pharmacy, retail food, child care services for patients and clients, and conference space.